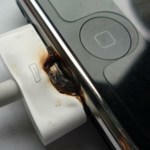 iPhone Catches Fire: Fluke or Safety Hazard? Tim Colburne plugged in his iPhone 3G to his computer’s USB port and left it to charge. Three hours later, it caught fire. The above is an aftermath pic. Colburne writes on his blog: “The fire started in the space between the lead and the phone and resulted in a couple of pins fusing together. Colburne reckons very few iPhones go up in flames, he was able to find one other similar incident on a site from Sweden in 2008. And if your iPhone did go into meltdown, how did getting a replacement go? Two of mine caught fire, don’t know if the phone will still charge after the last one.